Of Verdi's innumerable youthful works, the manuscripts of only a few have been found and are known. Some of Verdi's utterances, with which he sharply criticised his production before turning towards opera ("Oh dear! I admit that I wrote this Tantum Ergo some sixty years ago! I recommend that the owner of this unhappy work throw it into the flames...") have contributed to the conviction that a large portion of these valuable autographs was destroyed in accordance with the composer's whishes. It is difficult to understand how it could happen that the works of Verdi's youth were dispersed so far and in so many directions. 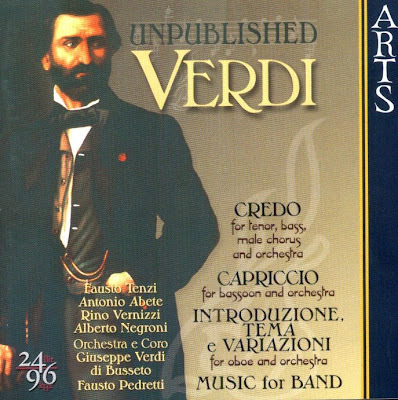 The source of the music introduced on this recording (the Fondo Cocchi-Cavalli, the name of which comes from two Busseto families who inherited the manuscripts) represents an important element in the reconstruction of the puzzle of Verdi's youthful instrumental works and is an important contribution to a better understanding of Italian instrumental music of the nineteenth century. The CD was released by ARTS, 2001 (DDD 24bit/96khz). ARTS 47574-2.